How much effort do you put into conserving energy throughout your daily routine? Diligence in keeping lights and appliances turned off are great steps, but those selfsame appliances likely still draw power when not in use. Seeing the potential to reduce energy wasted by TVs in standby mode, the [Electrical Energy Management Lab] team out of the University of Bristol have designed a television that uses no power in standby mode. The feat is accomplished through the use of a chip designed to activate at currents as low as 20 picoamps. It, and a series of five photodiodes, is mounted in a receiver which attaches to the TV. The receiver picks up the slight infrared pulse from the remote, inducing a slight current in the receiving photodiodes, providing enough power to the chip which in turn flips the switch to turn on the TV. A filter prevents ambient light from activating the receiver, and while the display appears to take a few seconds longer to turn on than an unmodified TV, that seems a fair trade off if you aren’t turning it on and off every few minutes. We’re looking for solutions to problems that matter and water waste is high on that list. This week we challenged you to think about Big Water; ideas that could help conserve the water used in agricultural and industrial applications. Take a look at some of the entries, get excited, and start working on your own idea for the 2015 Hackaday Prize. That’s right, windtraps. Like the Fremen of Arrakis there were a few hackers who propose systems to pull moisture from the air. The RainMaker is targeted for urban farming and explores the possibility of passive systems that water themselves automatically. [Hickss] admits that there are some limitations to the concept. Small systems would have limited ability to collect moisture and a need for direct sunlight in order to be solar powered. However, if you’re growing food we figure direct sunlight was a pre-requisite anyway. On a bit grander scale is the Smart Dew-Point Water Harvester which is shown off in this diagram. The proof of concept at this point is a desktop system that collects moisture on a small heat-sync. Scroll down to that project’s comments and read about the possibility of building the system underground to take advantage of the naturally colder area. For us the interesting question is can this be done in conjunction with traditional irrigation? Is a lot of irrigation water lost to evaporation and could reclamation through these means make an impact? Simple but powerful: only water when the plants need it! Here are several entries focused on sensors that make sure fields are being watered more efficiently. The Adaptive Watering System focuses on this, seeking to retrofit current setups with sensor pods that make up a mesh network. We found the conjecture about distributing and retrieving these pods using a combine harvester quite interesting. Going along with the networked concept there is a Moisture Monitoring Mesh Network which proposes individual solar-powered spikes. Much of the info for that project is embodied in the diagram, including a mock-up of how the data could be visualized. One thing we hadn’t spent much time thinking about is that fields may be watered unevenly and a sensor network would be a powerful tool in balancing these systems. Wrapping up this concept is the Soil Moisture Sensor for Agriculture. [JamesW_001] rendered the image seen above as his concept for the sensor. Toss the orbs throughout the fields and the rings of contacts on the outside make up the sensor while the brains held safely inside report back wirelessly. Two projects tackled plumbing. The first is the Solar Water Pump seen here. Focused on the developing world, this array provides water for multiple applications, including agricultural irrigation, and can be used for wells or surface water sources. Once that pump gets the water moving it will be taking a trip through some pipes which are another potential source of waste. When buried pipes leak, how will you know about it? That’s the issue tackled by the Water Pipeline Leak Detection and Location project. When the water pipe is buried, two sets of twisted-pair conductors in permeable sheathing are also buried along with it. These redundant sensors would use Time-Domain Reflectometry (TDR) to detect the location of a short between conductors. We’re a bit fuzzy on how this would detect leaks and not rain or irrigation water but perhaps the pipe/wire pairs would be in their own water-shedding sleeve? First place this week goes to the Smart Garden and will receive a DSLogic 16-channel Logic Analyzer. Second place this week goes to Soil Moisture Sensor for Agriculture and will receive an Adafruit Bluefruit Bluetooth Low Energy sniffer. 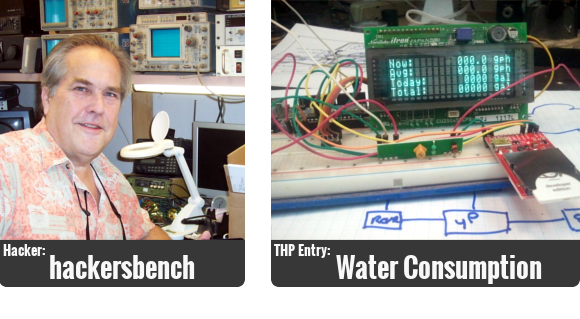 Third place this week goes to Solar Water Pump and will receive a Hackaday robot head tee. We’ll announce next week’s theme a bit later today. Don’t let that stop you from entering any ideas this collection of entries may have inspired. Start your project on Hackaday.io and add the tag 2015HackadayPrize. Remote sensing applications that make sense and cents? (sorry, couldn’t help ourselves) That’s what [hackersbench], aka [John Schuch], aka [@JohnS_AZ] is working on as his entry for The Hackaday Prize. He received a multi-thousand-dollar water bill after having an underground pipe break and leak without knowing it. His idea will help you notice problems like this sooner. But if you actually have a way to capture data about your own water use you also have a tool to help encourage less wasteful water use habits. We wanted to learn more about the hacker who is working on this project. [John’s] answers to our slate of questions are after the break.